Both 'National' Aboriginal Art Galleries on Hold! at News Aboriginal Art Directory. View information about Both 'National' Aboriginal Art Galleries on Hold! Both 'National' Aboriginal Art Galleries on Hold! What is it about projects to create a national Indigenous/Aboriginal art or cultural centre that seems perpetually doomed? Sydney thought about it for Barangaroo, Perth has talked about it. The NT got really excited when the current ALP government was elected and announced not one but two 'Iconic' institutions for Alice Springs covering both the art and culture, established committees and appointed executives and set aside $50m (which it seems they don't really have! ), and chose a site that's turned out to be a quagmire for the project. South Australia, meanwhile, had a redundant hospital site in Adelaide's city centre and a new Liberal government which quickly identified Aboriginal (rather than contemporary) art and culture for a site that already had a spiffing design commissioned by the previous Labor government. But then they were offered Federal funds to start a Space Agency on that very site (maybe?) and seem to have grasped them. No clarity, though – as the website architectureau.com has declared: ”The Australian Space Agency will be based on a site formerly set aside for a contemporary art gallery in central Adelaide, the federal and state governments have announced”. Meanwhile, +another source is equally confident that “The deal is designed to drive a globally-relevant centre of innovation and house start-ups alongside a National Gallery for Aboriginal Art and Culture”. It seems the real answer is positive - the Space Agency can coexist with Aboriginal Culture. Hoorah! And we don't have to wait until ex-Ozco CEO Tony Grybowski produces an overarching arts report to the State Government in 6 months time - though I guess he might disagree! There's pretty much no uncertainty in the NT, but. 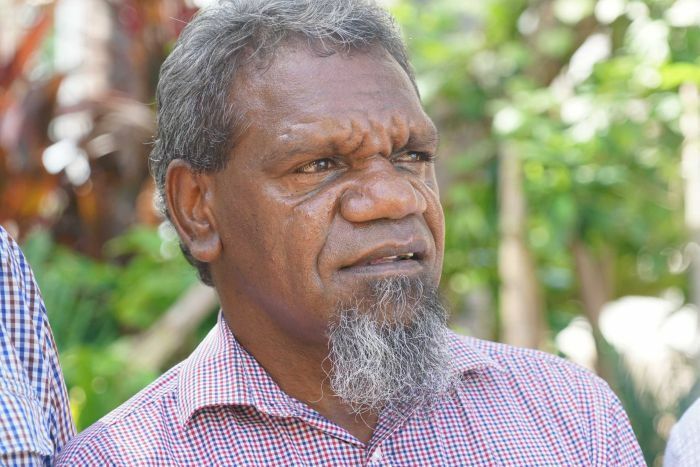 For the government's determination to establish its gallery on the fairly central ANZAC Oval site – ignoring an advisory committee and the local town council's views – has now fallen foul of local Arrernte Traditional Owners, who'd initially agreed to the siting when approached individually, but have now coordinated their joint views in the defiant negative. And Chief Minister Michael Gunner has admitted that “consideration will need to be given to the future of the National Aboriginal Art Gallery in Alice Springs”. 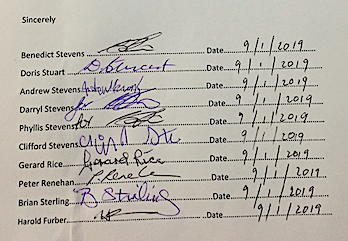 The signatories are Benedict Stevens, Doris Stuart, Andrew Stevens, Phyllis Stevens, Clifford Stevens, Gerard Rice, Peter Renehan, Brian Sterling and Harold Furber (see image). The letter says the signatories had “spoken to many of our Kwertengerle from here and other Arrernte Family estates, and they fully support us to make our decisions about what happens to our country”. It would seem that 'Divide and Conquer' may no longer work in the Desert! And this all happened just after the Territory Government had attempted to woo the Alice Council with a little funding to help them change their minds. Treasurer Nicole Manison wrote: “The land has a current compensation value of $3.6m comprising of the land value and disturbance costs. Alice Springs Town Council could propose compensation for acquiring the Anzac Oval that could be in the form of a land exchange, monetary payment, provision of infrastructure works, or a combination of these options, that would enable the council to deliver further priority projects for the people of Alice Springs. Government would be willing to negotiate the above compensation value for the fair purchase of the site up to the total value of $5m,”. Right from the beginning, the less-central Desert Park was an advisory committee's preference for this Gallery, but the Government – which has just announced a new central Darwin iteration of the Museum & Art Gallery of the NT – decided that tourist reluctance to go the extra mile was an insuperable benchmark that limited its thinking to the ANZAC Oval. Or should we now be setting our sights on the National Capital for an absolutely necessary Indigenous Cultural Institution – not a gallery. We've tons of them holding much of the best art there's ever going to be. 31.10.18 | DO WE WANT AN INDIGENOUS ARTS AUTHORITY?